The Pelagie Islands are found in the Mediterranean Sea, between Malta and Tunisia with Sicily to the north. They are some of Italy’s most beautiful islets, comprising Lampedusa, Linosa and the uninhabited Lampione. They are an ideal destination for beach lovers, with Lampedusa’s ‘Isola dei Conigli’ frequently voted in the world’s top ten list. Alongside Linosa’s beach, it is one of the last remaining Loggerhead Turtle egg laying areas in the Mediterranean. Be sure to try some fresh, local seafood at one of the excellent restaurants on Lampedusa. Or simply wander through the idyllic town in search of a small, pretty church called ‘Madonna Di Lampedusa’. Linosa is a smaller island with three volcanoes, so it offers picturesque black sandy beaches. It is a great place to come for lunch, as it has some charming and authentic trattorias in the main town. Lampione is the smallest and only uninhabited island. However, it offers fantastic scuba diving opportunities, as it boasts colourful coral, lobsters and crystal clear water. Dives can be organised at one of the many diving schools on Lampedusa. The islands are situated close to North Africa, therefore they are home to similar wildlife. You're likely to come across whip snakes, Eleonora and Barbary falcons, crested cormorants and yellow-legged gulls. The ferry route takes you between Lampedusa and Linosa, with a few crossings provided every day lasting around one hour. 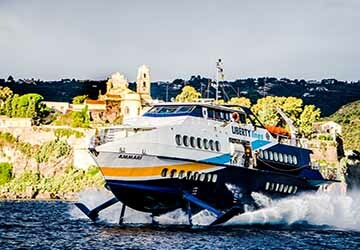 The route is operated by Ustica Lines, who provides high-speed and comfortable ferries, making it even easier to explore the beautiful Pelagie Islands. 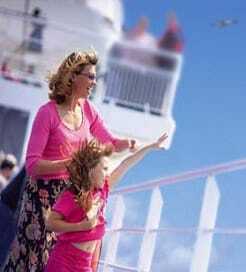 For more information, please visit our Ferries from Sicily to Pelagie Islands page.